nearly there with the resistors & diodes, i've bought connectors for wiring properly instead of my usual crows nest of wires , decided to go banana for patching with a few converters to 1/4 inch, i also got yusynth saw animator pcb from Bride Chamber to add to the final design, not sure whether to add ken stones sub osc pcb as well . 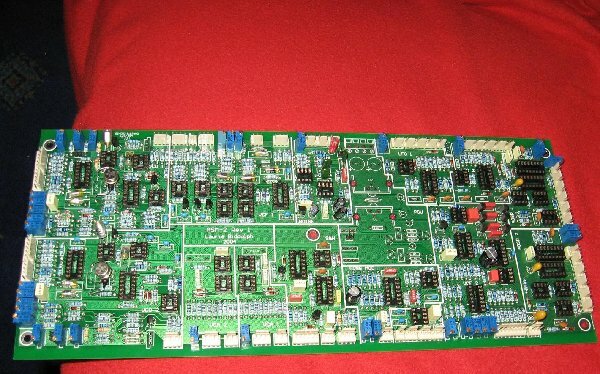 very good quality pcb from elby & Bride Chamber, good stuff. huge project and nice layout. i am curious to see more pictures soon. What are your front panel dimensions? I've got mine drafted out to fit 14u of standard rack space, yours looks much smaller than that. Nice work! Thanks Matthias, took a few weekends to plan this one, i'm building a seperate power board to supply the asm & extras, i have made the box with iec fused socket to house it and have a torroidal Xfrmr ready to go in. I'll add more pics as i go. Hi crochambeau, 3mm alum panel is 590mm X 300mm, a guilloteened off cut from my local engineers workshop with clean cut edges from using hydraulic cutter machine. The design above will be lasered to vinyl sticker when finished, i thought i may have had room to fit a few lunetta circuits but i'm out of space already. i would love to see pics of your asm, Uncle K's beast is amazing with the veneer effect. Yeah I have been working on an ASM-2 for a bit also but I keep moving to other projects and getting distracted. I need to just sit down and finish it. Mine is also banana. It took Elby and I a bit to figure out a way to get the banana jacks to fit in the pre-drilled holes. Finally a combination of washers and nuts worked out. And quality wise yes Elbys stuff is fantastic. It is almost over engineered. I love it. He has kept me supplied with quite a bit of stuff. I am working on a Sound Lab Ultimate also that he was able to get me the parts for. had some spare time recently to do a little more to the ASM 2, hoping to get finished before Xmas holidays, i'd better get a complimentary hamper from Rapid electronics for christmas for all the orders put in over the last few months he he he. thanx , dark orange vinyl caught my eye at the print shop, working on the wiring & crimp connectors next few nights , hopefully have tone's emmiting from it in a fortnight. 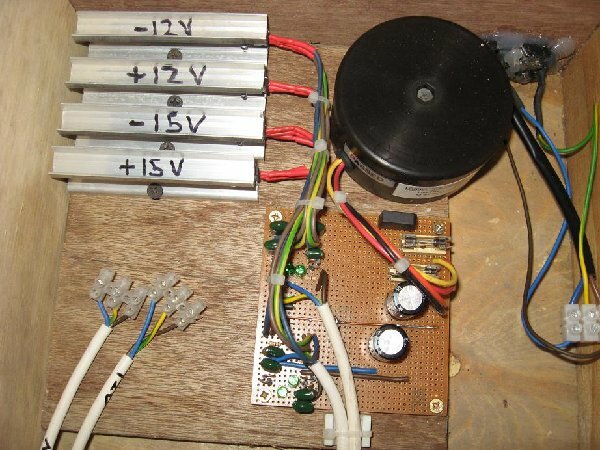 Dual Power supply done now, getting +/- 11.98V and +/- 14.97V, happy with that. I also used alum mounting bar chopped into 4 bits for some healthy heat sinks for the 12V & 15V reg's. 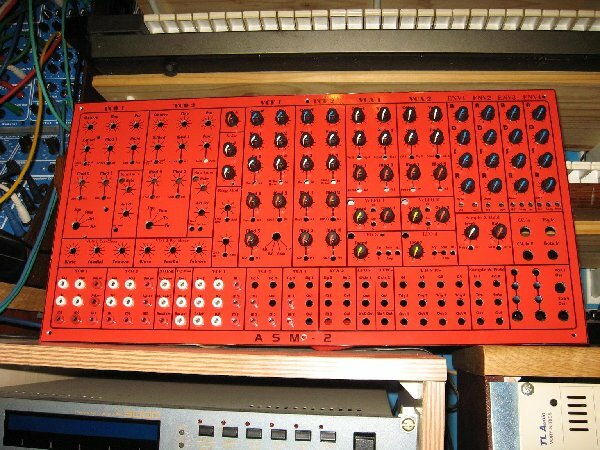 50VA 2x 25v/0v torroidal for asm / saw animators / extra adsr's / extra lfo's & pre-mixers as well as side of cabinet dual supplys for further modular expansion . I seem to have an abundance of mylar capacitors , so i used some for the smoothing, also kept the smoothing caps on the asm as well as big caps on the vero power board. ASM holds well with a "no chip" power up test, fingers crossed the luck keeps going he he he. Nearly finished the wiring, then it's time for test & calibration and hopefully celebration , error dependant of course. I've been getting home from work and resisting the lure of the couch to wire it up, probably annoying neighbors using a cordless drill to twist wire looms at nights , . must tidy those wires with some zip ties. 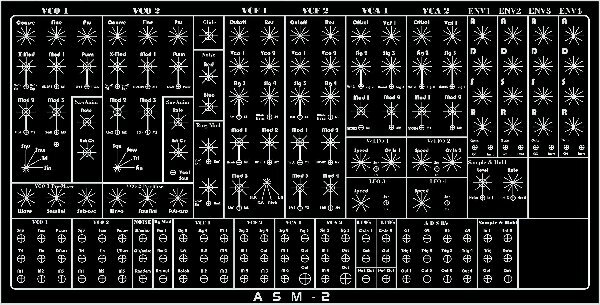 Posted: Sun Nov 29, 2009 9:10 am Post subject: ASM..2 "it's very, very musical"
Worth the wait to get this synth up and running, i'm really impressed with the sounds and tones available on the ASM-2, adding 2 saw animators (thanks Yves & Bridechamber !) has ehanced the sound even further. I have allready had some new ideas for new tracks for ORCHARD & EPICYCLUS within an hour of trying it out after finishing building, fantastic. When building the asm, i found it best to refer to the genie / wizard / asm manual & various wiring options pdf doc's, to get a more rounded instruction on the build , referencing between all these doc's helped me with a few hiccups and stumbles when constructing. Here below is a selection of sounds from my ASM-2 finished build all sounds are free of FX , just the synth apart from "major force" it has a little verb on it, a little bit of the 1979 album influence to it, ha ha ha . Posted: Sun Nov 29, 2009 9:24 am Post subject: Re: ASM..2 "it's very, very musical"
ok ... but it sounds like a good job! 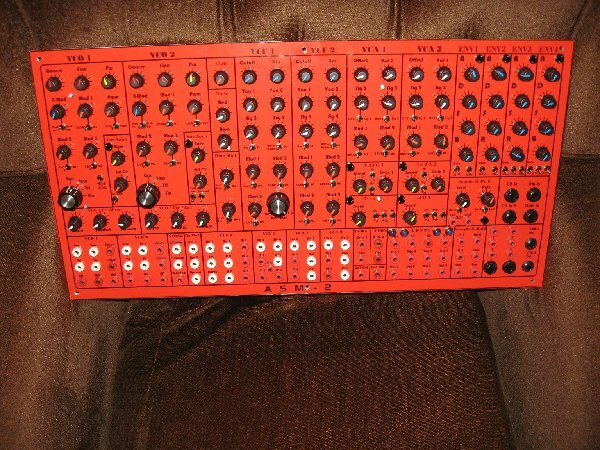 Hi Jan , the synth is going to get a good workout on the Newyear event, it's debut apperance with Epicyclus a reasonably trouble free build from pcb & special component kit from Elby designs , sourced the rest of the components from uk outlets. Looking forward to that Dave! Going to be a good event Jan .
ABSOLUTLY IMPRESSIVE WORK DAVE !! I love the RED panel to. Thats one BIG build ... 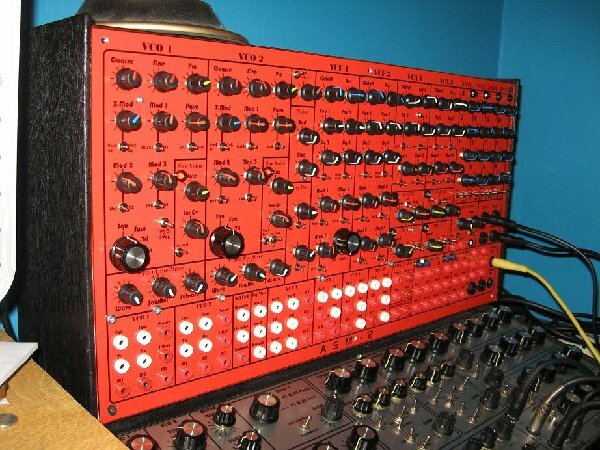 I really look forward to your forthcoming records using this synthesizer. Hey Bill, Cheers , Thanks for having a look & listen, this was constructed while listening to a lot of electro-music radio shows (even if i was not active in chat, busy with a hot iron ). Seems a few folks hearing the very rough "Tangerine dream - force majeure "melody + sequence mp3 , it was the first thing that was in my head when testing the synth , ha ha, fun on the keyboard. Well that is great AND I tell you, there are so many cool examples of panels ..... your head will go DIZZY Have fun with it ..... 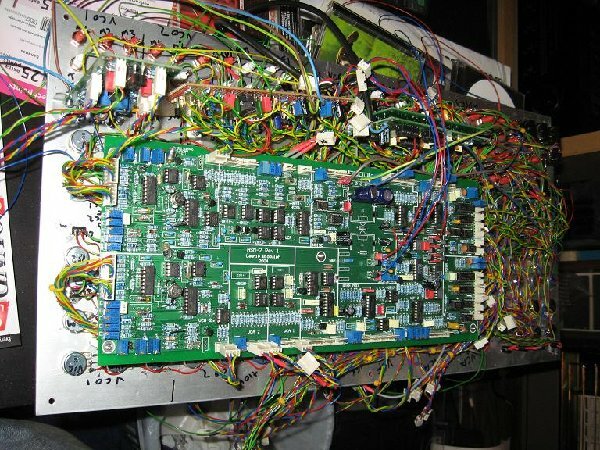 Your a seasoned pro so I probably don't have to tell you BUT those "many" cables are a frekin chore dude !!! 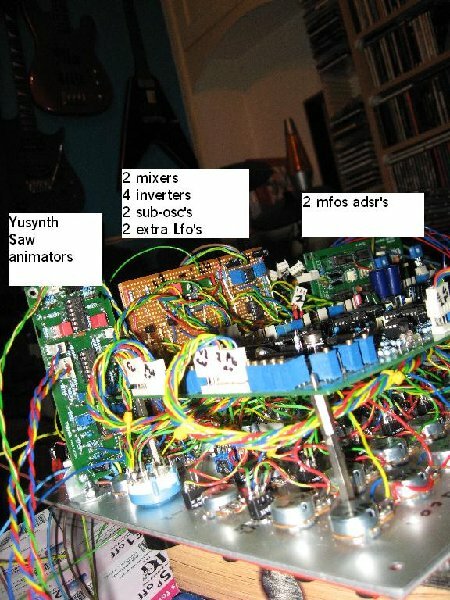 I enjoy plopping chips and components down onto the boards and listening to music ,... thats my relaxation. On the further subject of panels ... my first panel was custom designed by myself and the second one I have waiting in the shadows is one of those cool circular designs by Bridechamber. Reasonable price to at about $100 USD. 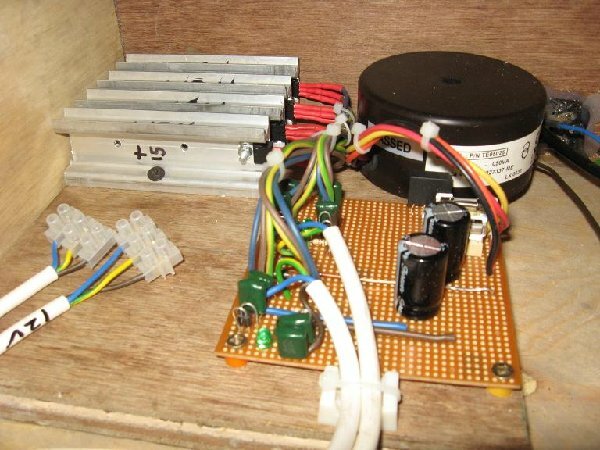 It does not seem like 15 years ago starting my first electronic music kit.... the Maplin electronics Voice Vandal... and a filter circuit from "The Mix" magazine diy series . Im far from seasoned pro... seasoned with herbs maybe he he. Hi hows it going ?. 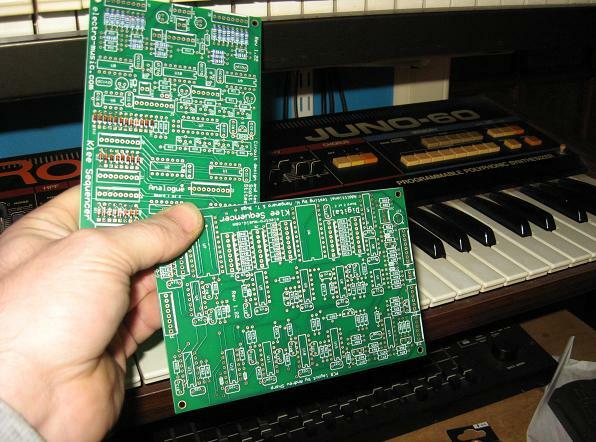 are you getting a pcb with the good exchange rate just now or are you vero boarding the synth ?????. Did you get sorted out ok for panel material for the soundlab ?? 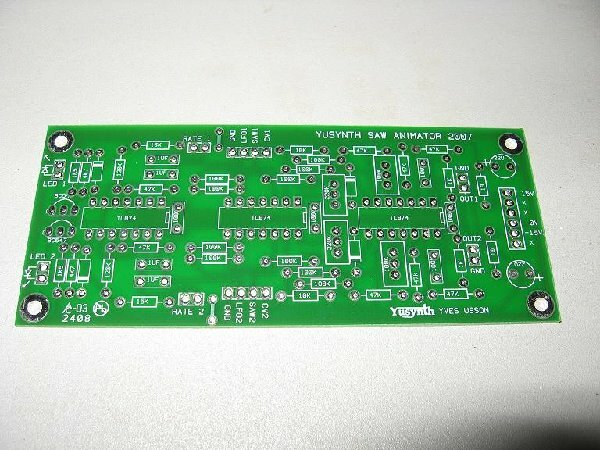 I think I'll buy the PCB, a lot less headache at very little cost. that said, I have a Soundlab ultimate to build first. 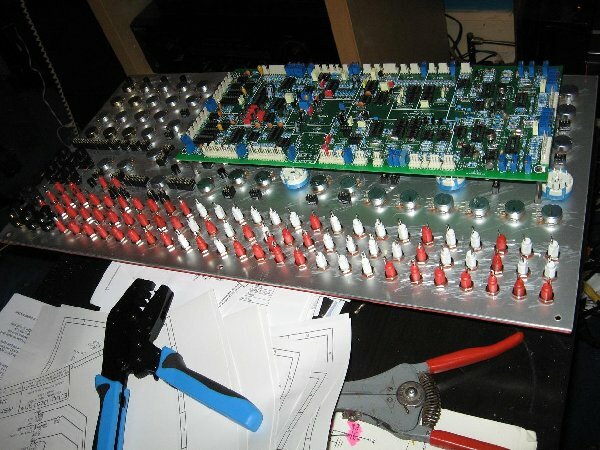 Speaking of which, my stripboard soundlab ended up in a plastic maplin case. I have the aluminium cut for my modular panels, but have no idea how to print onto it.